Decisions, decisions. As we reported last night, Verizon is now taking pre-orders for the BlackBerry Tour with a launch date of July 12th now made official. But if you mosey over to Big Red's web site to put in your order for the 9630, you are immediately struck with a choice to make-camera or no camera? 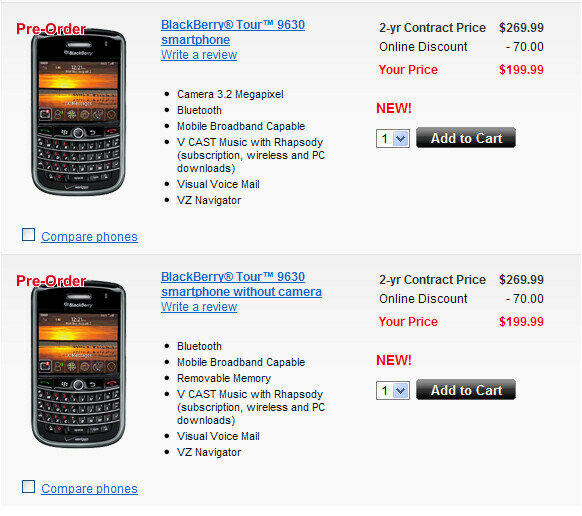 The two phones share the same model number and price, although we're pretty sure that the shooter costs more than $0 for RIM to procure the necessary parts and labor to put on the device. Actually, the reason for the choice is to allow those who work for firms that are sensitive about photography in the work place, to still buy the Tour and bring it to work. And it also allows those said companies to buy the Storm for their employees without having to ban them from the work place environment. Just make sure you remember which version you buy because it would be embarrassing to get a subject ready for a photo and then find yourself without the camera. Well i guess they're just trying to make the phonea avaliable to everyone but what kind of place would really be that strict that you couldn't bring a phone with a camera? Or financial institutions, with concerns around customer privacy and data. Or companies with Non-disclosure agreements that are big into intellectual patents. a court room duh! MotoQ9cFTW! I want to pre-order a Tour, but I think I'm going to hold off to see how the reviews are for it. The Storm ruined my confidence in Blackberry. why? what was so bad about the storm you didn't like? name a problem? what's wrong with the touchscreen? I use my Blackberry for work and it's very slow to navigate between menu's and options. The OS is very sluggish, even after the last update which made a big difference. Typing on the phone is very difficult, especially one handed if you're multitasking. Although the screen is large, it's still small enough that the size of the keyboard is limited. This may be why RIM is expanding it to include the call and end button in the Storm 2. Everybody in my company who has a storm has quit replying to emails since they've switched from either a curve or older model Blackberry. Additionally the call quality on the Storm is horrible, I actually forward my voice to an alternate phone to avoid having people complain about the quality. I've owned quite a few Blackberry's and this is my first real dissapointment. I wasn't overly satisfied with the Blackberry Pearl, but that was strictly preference. A friend of mine has the Curve 8900 and it's amazing how much faster the Curve is then the Blackberry. Even the old Curves run circles around my Storm. If you like the storm and touchscreen I would hold out for the Storm 2 that is supposed to be released soon enough. I just can't stand my storm. I type semi-long emails for work and it doesn't allow me the speed my other phones have offered. As for the landscape keyboard, I think the traditional Blackberry is easier to type on. I'm guessing the buttons on the storm 2 will be bigger since they'll have more screen space available. I think removing the clicking feature will also allow them to expand the size of the screen slightly too. I think my next two moves will be for the Blackberry Tour (as long as the reviews are decent) and the Blackberry Aries (sp) since it will offer Wifi. I'm hoping the Wifi will allow for some sort of Wifi calling. Tmobile offers wifi calling and it is not a free service thus they still make money. Tmo @ home and hot spot calling. Works rather well with my Crackberry. what the hell? ok uh just get a different phone without a camera DUH or dont use it!!! and why is the price still the same if one has a camera and one doesnt? Certain companies don't allow you to have a camera onsite, they want the functionality of the latest Blackberry without a Camera. I think this was a great idea. As for the price, the cost to produce a model without a camera is less, but manufacturing costs increase to offer two models. I think they are selling them for the same price to recover some of the additional expense to set up a second manufacturing line, but that's just my opinion. How many (good) phones are made nowadays without a camera?